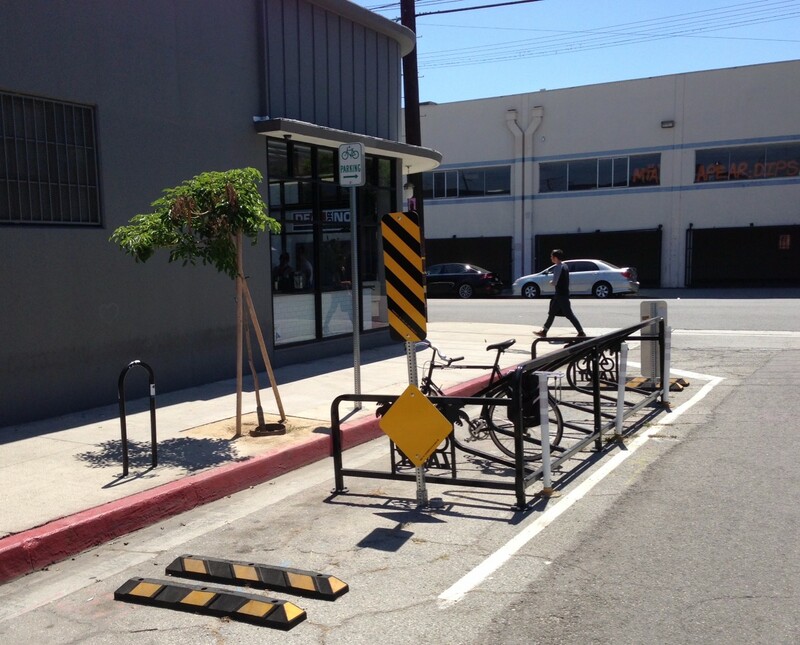 Downtown Los Angeles’ first bike corral (really) in front of Blue Bottle Coffee. Photos by Joe Linton/Streetsblog L.A.
A couple weeks ago, I reported that the great new bike corral on Main Street at 5th was the first in downtown Los Angeles. Commenter Steven White correctly pointed out that there are indeed two other on-street bike corrals in the Downtown Arts District. So although it is the first in the historic core, the Main Street corral wasn’t the first downtown L.A. bike corral, nor was that my first or or likely to my last error to appear in writing. I checked in with Elizabeth Gallardo, L.A. City Department of Transportation’s (LADOT) assistant bicycle coordinator, and the brains behind LADOT’s bicycle-friendly business programs. According to Gallardo, the the bike corral on Willow Street at Mateo Street was the first in downtown L.A., having been installed in October 2014. That corral serves and is sponsored by Blue Bottle Coffee‘s cafe at 582 Mateo Street. 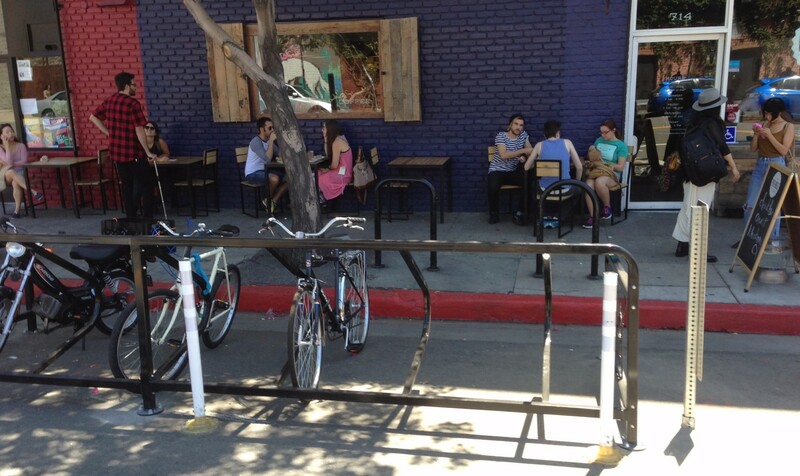 Downtown L.A.’s third great bike corral in front of Pie Hole. On June 15th, LADOT installed both the Main Street corral, sponsored by Peddler’s Creamery, and a third corral on Traction Avenue at Hewitt Street, sponsored by The Pie Hole. The Main Street corral edged the Traction Avenue one out by a couple hours to claim the vaunted second-corral silver medal. These fine establishments clearly support L.A.’s bicyclists, so I encourage all of us bicyclists to support them! And LADOT is still installing more corrals. Each bike corral replaces one on-street car parking space with space for about a dozen bicycles. If you want a bike corral in front of your business, follow the instructions found on LADOT People St.
It’s interesting that when LADOT installs bike corrals, they place the most prominent warning signage facing away from the near-side car traffic. Odd, but no biggie. I was told one reason for this was that it’s designed for non-observant drivers backing up, not seeing a car above their trunk line so they would hit the corral. Especially when the corral is empty. I guess they figure that driving forward, even a non-observant driver would see the corral and the bikes. I can see how that might help. Why is there a ‘moped’ parked in a bicycle corral? We know that there is ‘pedaling’ involved in the operation, but are we not encouraging more ‘bicycle parking’ and not ‘bike (motorcycle)’ parking? There is motorcycle parking to accommodate these types of vehicles. Holly F-bomb! You see how many bike lock u-stands (or whatever they’re called) around the Blue Bottle Coffee shop? How come these things don’t get spread out in the city? Maybe I’m missing something here? They’re expecting a big influx of caffeine addicted bicyclists? Well… my guess is that the inverted-U racks get installed cheaply and quickly, and then it takes a bit longer for the bike corral – so you end up with the two types of parking together… redundant – but – the more the merrier, I think – what driver ever complained about too much car parking? I’m glad you asked. I haven’t been there yet, but from Google maps I count 31 of those U racks! And that’s just from the middle of the block to the intersection of the coffee shop. This also includes the ones across the street. I would like to think there’s some kind of conspiracy brewing to get all these bikers all jacked up on caffeine, but sadly it looks like the city just dumps these racks in one location to get “the job done” as quickly as possible. Mopeds are treated more as bicycles under the vehicle code, since they are banned from freeways, for instance. Electric bikes can and should be parked in bike racks as well. There is not designated motorcycle parking on most streets – either you jam it in the space between two cars, or in the case of streets which have hash marks for vehicles, the motorcycle takes the entire car space. I’ve seen the Street View of that corner. Those aren’t LADOT’s U-racks. They’re a bit narrower and have a continuously rounded shape, whereas LADOT’s racks have a more squared-off shape with rounded corners. Most likely those racks were installed by a private property owner. We agree that electric bicycles should be able to be parked in the bicycle stalls shown above. At least twice a week, we share a bicycle stall on the Metrolink train with a gentleman with an electric bicycle. Mopeds are registered vehicles and as a result are subject to different rules on the road. Mopeds are not allowed in ‘bicycle lanes’ or allowed on designated ‘bicycle paths’ (a friend was given a ticket for riding a moped down the LA river trail — and lectured on the difference between the two a few years ago). Mopeds are not in any case allowed to ride on sidewalks. Maybe the motorcycle community should raise awareness of the lack of space available for their vehicles to park in the city? We would like to see the bicycle racks remain available for bicycles — for which they were built. Maybe the LADOT allows mopeds to park in bicycle racks? CVC 21207.5 allows for operation of mopeds within or adjacent to the roadway, unless otherwise banned by local ordinance (which would need to be signed). https://www.dmv.ca.gov/portal/dmv/?1dmy&urile=wcm:path:/dmv_content_en/dmv/pubs/vctop/vc/d11/c1/a4/21207.5 Therefore they ARE permitted on bicycle lanes, but not off street paths (unless it is a protected bike lane or parallel trail). We stand corrected on bikelane use — thank you for the update. Evidently, there are a few police officers patrolling the region who are not aware of CVC 21207.5 . Yeah I had a chance to go by there this weekend. I miss counted the racks online. I counted 47 total racks. 44 put there by some art district council and 3 by LADOT. You’d think these racks would be put around the art district rather than “flood” areas. Use them intended purposes and not some “art piece”. 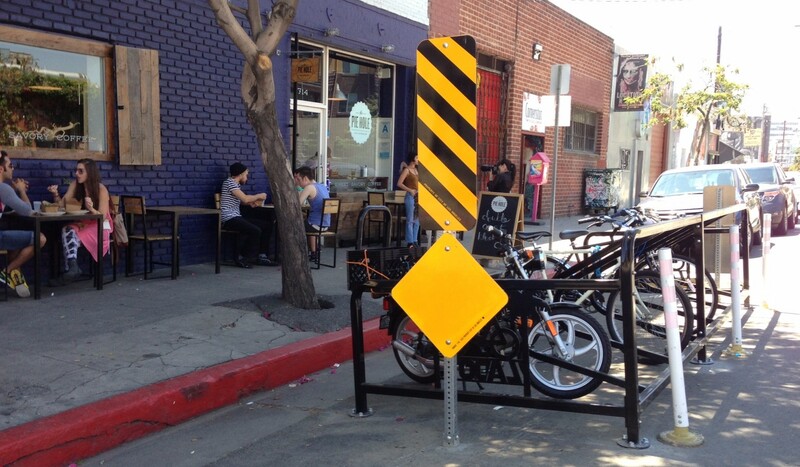 Two New Bike Corrals Installed on Abbot Kinney Blvd.